We‘d like to thank our friends, fans and families for an awesome 2018 and wish you all the best for 2019!!! Three days before our tour with Axel Rudi Pell kicks off we present our brandnew lyric video for the song "You Got Me Wrong", taken from our new album RISE! "RISE" entered the OFFICIAL GERMAN ALBUM CHARTS!!! 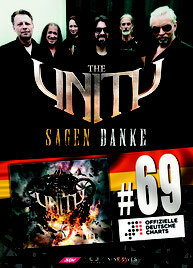 The new THE UNITY album entered the official german album charts at #69! What a great success...thanks to the fans and everybody involved!!!!! We can not believe it at the moment: our second album "Rise" entered the official german album charts! What we have experienced as a band in the last one and a half years is almost unbelievable: two great tours, many festivals and now the chart entry. As if this is not enough we are in the midst of the preparations for our next tour, which will take us across Europe with Axel Rudi Pell. We are looking forward to meet our friends and fans again, whom we can not thank enough for their support! 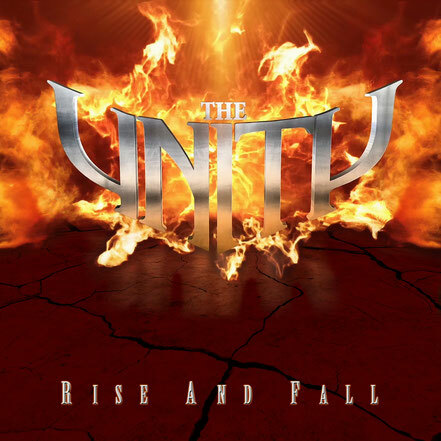 German-Italian melodic metal act THE UNITY release their second single and video for the song "The Storm" today. The song is taken from the forthcoming studio album "Rise". Drummer Michael Ehre says: " "Full of joy and pride we present "The Storm", the second single and the first official videoclip from our brandnew album "Rise". The song is the perfect example for what our music is all about: energy and melody. We hope that you have as much fun watching as we had shooting the clip!" We proudly present you our first single and lyric video "No Hero", taken from our forthcoming studio album "Rise". New album finished!!! Out on September, 14th!!! 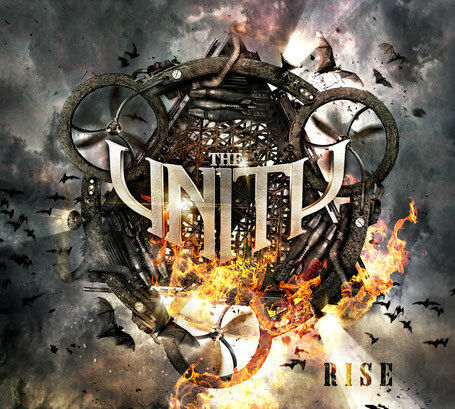 Only about a year and a half after the presentation of their self-titled debut album in spring 2017, German-Italian melodic metal act The Unity are ready to strike again: 14 September 2018 will see the release of their current album Rise on SPV/Steamhammer. The recording features 13 brand-new songs and was cut by drummer Michael Ehré (Gamma Ray) at the B Castle Studio. Rise was produced by the band themselves and, like its predecessor, mixed and mastered by Spanish sound engineer Miquel A. Riutort at the Psychosomatic Recording Studio. The first single to be released from the album will be ‘No Hero’ on August 10th, the second single will be supported by an elaborate video clip. Aside from Ehré, The Unity continue to consist of guitarists Henjo Richter (Gamma Ray) and Stef, vocalist Gianbattista Manenti, bassist Jogi Sweers and keyboardist Sascha Onnen. “The new songs reflect the amazing energy and extremely enthusiastic responses at our shows, but also the very positive media reactions,” Michael Ehré sums up the material on Rise. 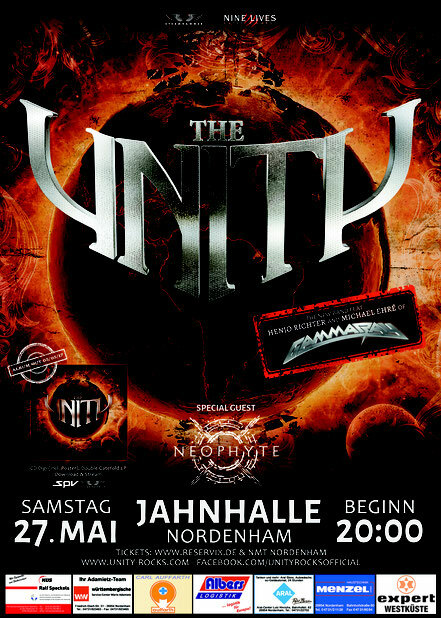 With their debut album The Unity were unanimously voted into the “Newcomer of the Year” category by the two leading German metal magazines, Metal Hammer and Rock Hard. Subsequently the six-piece enthralled their fans at tours with Edguy and Sinner and cleaned up at festivals such as Bang Your Head, Metalfest and Winter Masters Of Rock. Talking of which – soon after its release, Rise will also be presented to The Unity’s rapidly growing fan base as part of an extensive tour: from mid-October 2018, The Unity will accompany Axel Rudi Pell and his band, and the date of the big release show at Ehré’s home town of Nordenham has already been announced (see tour dates). So the second round of The Unity’s triumphal march is about to kick off! "Rise" will be released through SPV/Steamhammer on September 14th as limited Boxset (incl. CD, 2LP, flag, handsigned photocard, 6 track bonus CD, patch, sticker etc....), CD DigiPak, 2LP Gatefold, download and stream. 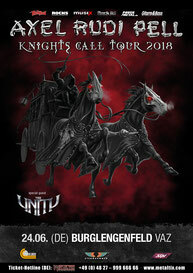 Before THE UNITY will support AXEL RUDI PELL on his 2nd leg of his "KNIGHTS CALL-TOUR 2018" starting in October, we will play a one-off-show on June, 24th in Burglengenfeld/VAZ. We will enter the stage at 7pm! We´re happy to announce that THE UNITY is confirmed for this year´s METAL HAMMER PARADISE-Festival! The METAL HAMMER PARADISE will take place on 02. and 03. November in the beautiful surroundings of the holiday resort Weissenhäuser Strand situated right at the coast of the Baltic Sea. As some of us do appreciate a bit of comfort and do not necessarily need camping grounds, clammy sleeping bags, canned soup and waiting in line to use a porta-loo to get the real festival feeling, the resort provides fully equipped apartments, hotel rooms and several restaurants, cafés and bars. The concerts and performances take place indoors on three stages. And when, after a long night of dancing and headbanging the neck feels a bit stiff and the head a bit heavy, a nice walk on the beach or a jump in the pool followed by some time in the sauna or a relaxing massage will feel just right and help to get one’s energy back. The METAL HAMMER PARADISE combines the fun part of a true festival with the recreational effect of a short trip. It is a metal festival - but you won’t have to take a couple of days off to recover afterwards. 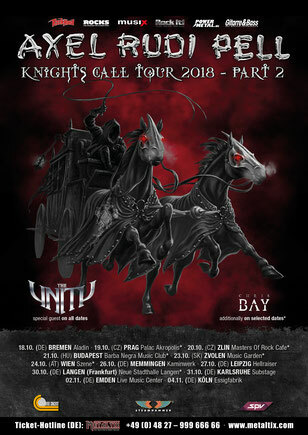 THE UNITY will hit the road again in October/November 2018 as special guest for AXEL RUDI PELL! This is what we call "perfect timing" as we´re in the middle of the songwriting process for our second album, which will come out shortly before the tour with Axel starts! “Chris Bay” (Freedom Call vocalist) will perform some acoustic songs on selected dates * ! The pre- sales just started! Make sure you get your tickets! THE UNITY livedates for 2018 so far...more to follow! THE UNITY confirmed for this years ROCK ONE WORLD, SICKING HIGH ROCK and MASTERS OF ROCK!!! 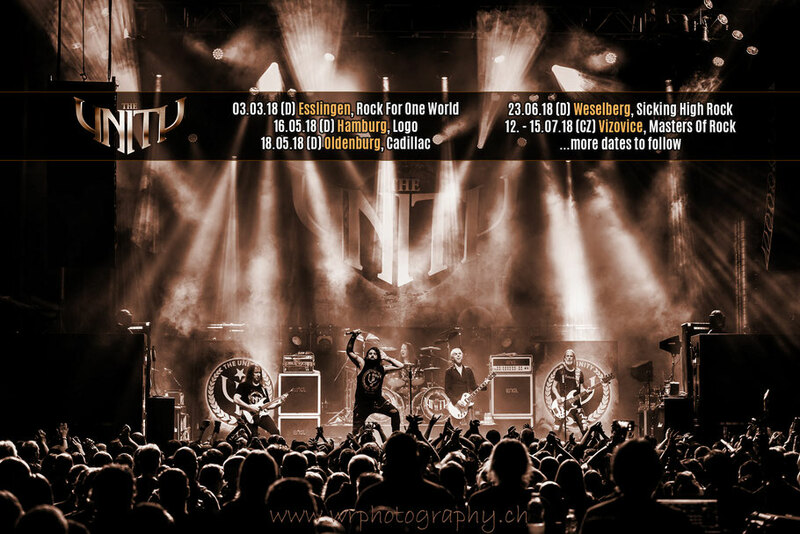 We´re proud and happy to announce that THE UNITY is confirmed for this years ROCK ONE WORLD (03.03.18) in Esslingen, Germany, SICKING HIGH ROCK (23.06.18) in Weselberg, Germany and MASTERS OF ROCK (12.07-15.07.18) in Vicovize, Czech Republic. THE UNITY "UniTV - Tourblog"
Check out our brandnew "UniTV - Tourblog"! Follow us the behind the scenes and on the road during our tour in autumn 2017. We released our third digital single and video for the song "NEVER FORGET" today. Drummer Michael Ehré about the single: "We are extremely happy to present our third single "Never Forget" shortly before our tour with Edguy starts. It will be released as Download and 7" Vinyl-Single with an exclusive, unpublished bonustrack. We also produced a brandnew videoclip for this song. See you on tour in September, October!" "Never Forget" will also be released as a 7" vinyl single, limited to 500 units worldwide, on September 15th,2017. The b-side is an unreleased track called "Nowhereland". 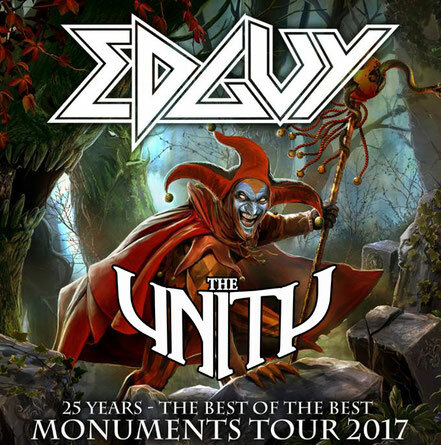 We´re more than happy to announce that THE UNITY will be special guest for the 25th anniversary tour of EDGUY!!! It´s a great honour to go on tour with one of our favourite bands! "It is with great pleasure that we can announce our support act for the 25 years of EDGUY - anniversary tour. 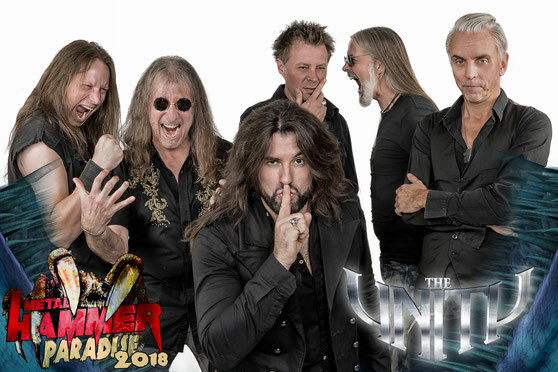 We'll be joined by our friends Henjo Richter and Michael Ehré (who you may know from GAMMA RAY, a band that EDGUY shared the stage with a lot in our history) and their new band THE UNITY! They have a superb debut album out, anthemic European Power Metal could not be any better! We are looking forward to hearing those great songs live as well as maybe some old Gamma Ray stuff, penned by my friend Henjo?! However, we are all looking forward to the festivities. And now - bring on September, let the celebration tour begin!" This is absolutely amazing! 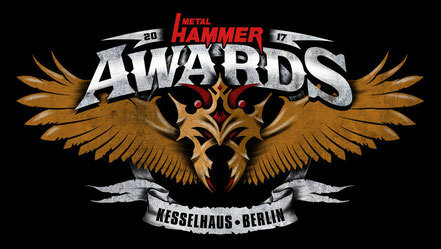 THE UNITY is nominated for this years METAL HAMMER-AWARD in the category BEST DEBUT!!! The Awards will take place on September, 15th in Berlin, Kesselhaus. 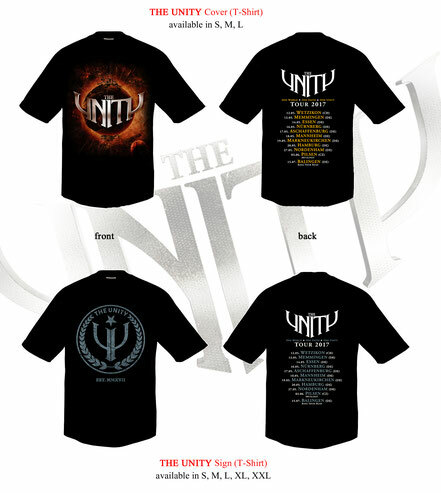 The debut album "The Unity" of THE UNITY, will be released on May 05th, 2017 through SPV GmbH/Steamhammer as CD digi (incl. poster), double gatefold LP, download and stream. 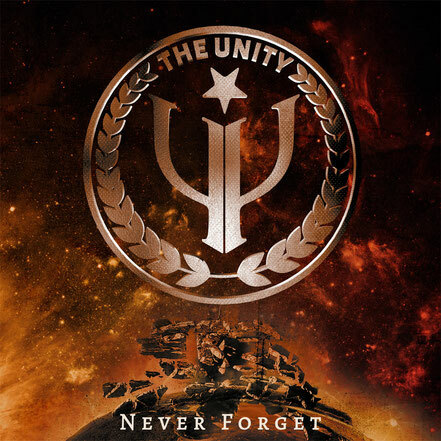 The amazing "THE UNITY" cover-artwork was done by Alexander Mertsch (http://www.bsights.de/), who already worked for Deep Purple, Gamma Ray, Saga, Savatage and Foreigner to name a few. Great news: THE UNITY will go on tour with SINNER in May. The debut album will be released on May 05th and the first digital single together with a video will see the light of day very soon! With their latest sensational signing, Hanover record imprint Steamhammer/SPV has set the course for more highlights in the coming year: UNITY, the new band founded by drummer Michael Ehré and guitarist Henjo Richter (both Gamma Ray), has signed a long-term contract and is currently busy working on their debut album. The eponymously titled recording has been scheduled for release in early 2017 and aficionados of powerful hard rock and technically accomplished melodic metal can expect to get more than their money’s worth. 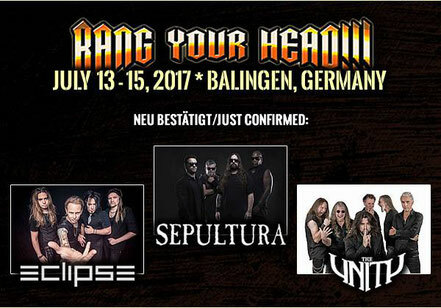 We´re more than happy to announce that we´re confirmed for this years BANG YOUR HEAD-Festival in Balingen. The festival takes place from July, 13th - 15th. We can´t wait to share this fantastic festival with all this fantastic bands!!! 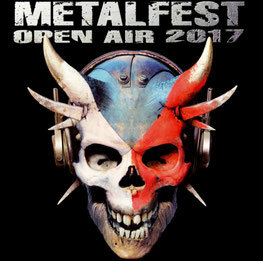 We´re happy to announce that THE UNITY are confirmed for METALFEST OPEN AIR in Pilsen/Czech Republic! The festival takes place at the Amfiteatr Lochotin in Pilsen from 02nd to 04th June, 2017! See you there! For more infos click here! RISE AND FALL out now! THE UNITYs first video "RISE AND FALL" will be released next Friday, 20th! This first track from THE UNITYs upcoming debut-album will also be released as a digital single on the same date! Here it is: the very first excerpt of our brandnew track RISE AND FALL from our upcoming debut-album. The single and the video for RISE AND FALL will be released soon! CD RELEASE SHOWS SOLD OUT!! !